Brandon Flowers best asset has always been his ability to convey emotion with even the most basic of lyrical content. Look at the Killers “Andy, You’re A Star” which soars like an epic even if the words are no more than jocular reminiscence. So now you have Flowers second solo outing which he has referred to as “what the Killers second record should have sounded like” and expectations begin to run high. BUT – that has always been what Flowers does, he shoots from the hip and sometimes he hits the mark and sometimes… well, not so much. 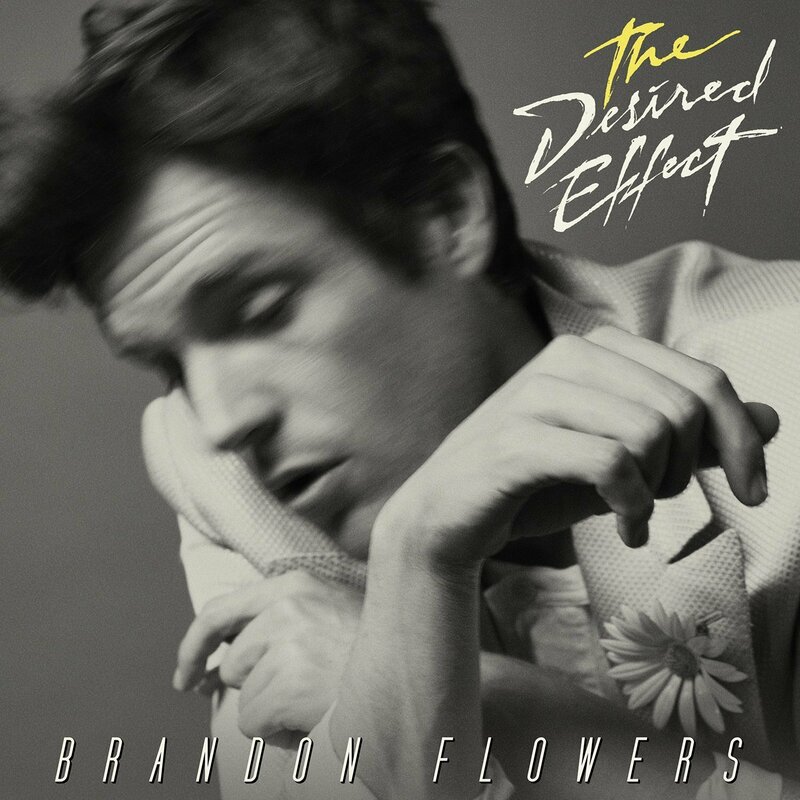 The Desired Effect comes off as being influenced by the biggest stadium rockers of the 80’s. “Dreams Come True” points towards Born In The USA Springsteen and it is followed by “Can’t Deny My Love” which is reminiscent of Security era Peter Gabriel. However both are bogged down with lyrical metaphors that drip of modern country music formula. The Desired Effect has the unfortunate problem of being bogged down in the sounds of a time long past without a twist of something new. It’s a perfectly pleasant listen but it also comes with a quick expiration date. I lived through it the first time, and it’s taken thirty years for it to stop being a bad soundtrack to everything 1984 and 1985. Maybe you had to be there, but Born In The USA was everywhere. Seven hit singles will do that. People who wouldn’t give Bruce the time of day were claiming to be his biggest fan and scrambling to buy tickets as he rolled into town in the summer of ’85. The local news networks went nuts when they thought it would rain on him… which you know it didn’t if you read my George Thorogood post from a couple days back. In fact, this may have been the first honest to goodness ‘backlash’ record of my teens. An artist you really like puts out something so big, you get sick of it without ever having to buy the record. Sure there were other big records out in the 80’s, but I wasn’t into Michael Jackson or Lionel Richie or… well, a whole lot of the music that was everywhere on every station no matter where you listened. So it is that thirty years later I’m listening to Born In The USA for the first time, on a turntable, with two speakers, and it sounds great. It sounds like I should have listened to it thirty years ago on a different turntable with a crappy set of speakers, or a cassette that would get worn down. What strikes me as odd is that it was this big. That people missed the messages of broken dreams and desolation strewn throughout the record. That amongst the repeated chorus of so-called sing along tunes that seemed oh so patriotic were messages of just how screwed up everything was. I’m not sure how anyone could have missed it; all his previous works had these types of stories and people. Still, Born In The USA was for many people where Bruce (the Boss) Springsteen ended. I never stopped being a fan, but I didn’t follow him into those personal albums that followed. Stories of marriage and divorce didn’t really interest me in my early twenties, and the music reflected the change in direction with the E-Street Band no longer in the picture. In fact by the 90’s, no one even talked about Bruce anymore. He won Grammy Awards, his music was featured in huge films, but amongst the music geeks of the world, Bruce was merely a shadow of the past or worse, a classic rock dinosaur; an artist relegated to being a nostalgia act. This is where a bit of revisionist history sets in. When first, The Rising (2002) and later The Seeger Sessions (2006) came out, middle aged former hipsters started to take notice again. Springsteen began touring with the E-Street Band and now a few short years later those same people who had wrote Springsteen off were scrambling for tickets and posting pictures of themselves at concerts on Instagram. It was all very curious to me as a music fan. As Bruce started to drift back towards political commentary through epic storytelling, fans came back – myself included. It’s just that I wasn’t sure how artist denial played in. Personally, I was never embarrassed to be a fan, but there was a time twenty years ago where many people thought it just wasn’t cool to admit it. Anyway, Record Store Day young and old hipsters alike lined up and bought the early Springsteen records on vinyl, and I bought the one Springsteen record I had avoided since its release. The guy behind the counter, at least twenty years my junior said “you’re really gonna love this,” and as it turns out, I do.